Beltane, or the Southern equivalent of May Day. Fertility is the keyword - creeks and ponds echo with frog calls, and seeth with their spawn, bees are swarming and wasps building new nests or repairing the old ones. 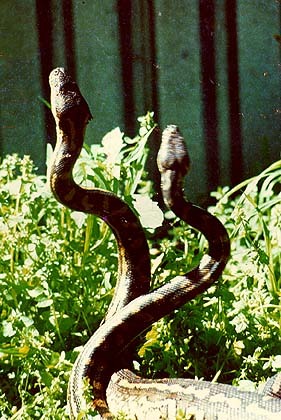 This picture of the mating dance of a pair of carpet pythons was taken by Wild Woman Sushona Murray, at CRYSTAL WATERS the world's first Permaculture Village, in Southern Queensland. These wonderful creatures are welcomed for their beauty, as well as providing natural rat control. This is a time to celebrate Nature's abundance! All our needs are bountifully supplied - if we share our true wealth, and resist the illusion of economic growth. Imagine yourself lost in the desert, your expensive 4-wheel drive broken down, water and food gone. A plane passes overhead and drops a sack. You rush to open it and find ................a million dollars. The love of money is an addiction; the belief that it is anything more than a means of exchange a destructive fantasy. So too with our fear of and resistance to, Death. Remember, as you keep All Hallows, that without Death there would be no room for new life, no materials from which it may develop. Just as Spring and Autumn, Night and Day, balance one another on opposite sides of the planet, so do Life and Death balance the existence of all things. As for the timing of the celebration - while the dates of the Solstices and Equinoctes are astronomical phenomena, precisely shown each year in astronomical tables or ephemerides, the Cross-quarters, originating in the ancient Fire Festivals, are much less precisely dated. They celebrated the important phases of the survival cycles - of food, whether hunted and gathered, or the product of agriculture, and of the seasons. Timing therefore depended upon locality as much as upon the position of heavenly bodies, and involved landscape and skyline. Since their adoption into the Christian Calendar, they have become fixed, with Hallowe'en or Samhain held on 31st.October (North) and Beltane or May Day on May 1st. Since there is a Dark Moon on October 27th. this year, it would seem appropriate to celebrate the feast of the Dead on or about that date, while in the South, November 1st. will see the young crescent moon in the evening sky - a most fitting accompaniment to rites celebrating fertility and growth.